Driving cross country in a vintage automobile is a true test of a marque’s quality and design. Stories are abundant of those who attempted the journey with it’s perilous tasks demanded from a decades old vehicle. Mountains, desserts, intense heat and hundreds of continuous running hours all take a toll on machines. Fortunately the cars produced by Alfa Romeo with race-bread design are up to the challenge. The Giulia Super four door sedan may seem like an odd car for a company with a sporting heritage to manufacture – but underneath its deceptive looking, extremely aerodynamic shape are the same components used on its two door sports cars: dual circuit four-wheel disc brakes, rear wheel drive, aluminum five speed transmission, all aluminum engine, overhead cams, hemispherical heads, dual weber carburetors. The Giulia Super and Ti car was released onto the market in 1962 and became one of the first true “sport sedans”. This particular Super that will make the journey is no stranger to long drives. In 2011 after a complete re-build, it participated in a drive from New York to California via the Lincoln Highway and back without a single issue. Some upgrades have been added to the Giulia since the restoration for this trip; new rebuilt carbs, new driveshaft, performance stainless steel exhaust, gear reduction starter. 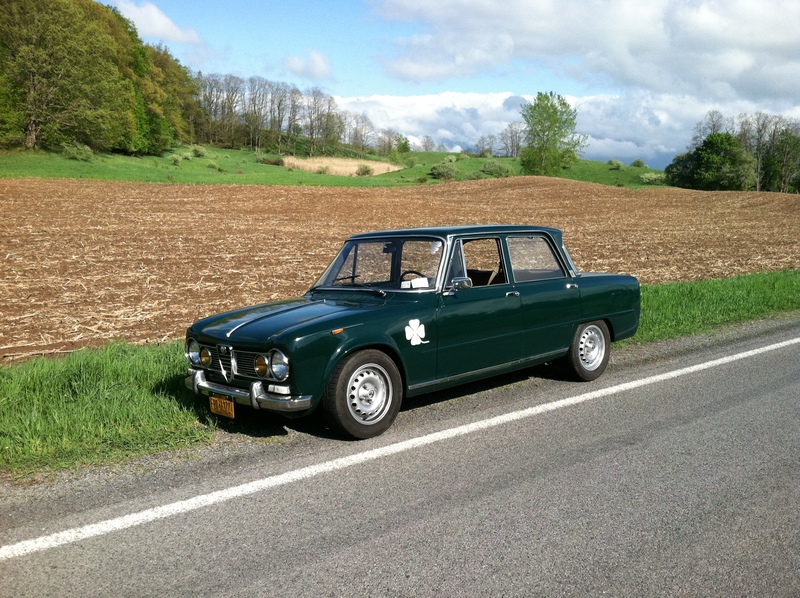 The Alfa Romeo that I will be driving on this trip is a green 1967 Giulia Super. I purchased it in 2010 from an Alfa bulletin board (www.alfabb.com) member in Seattle. The modifications that have been done to the car include level 2 Alfaholics suspension and electronic ignition. The car was painted by the previous owner and, although I love the color, she needs a paint job and a new interior in the future. In addition to the many Alfa drive events in Upstate New York, this Giulia has been to the Alfas at the Glen event in Watkins Glen in 2010 to celebrate the Alfa centennial event, and also to the 2012 Alfa Romeo Convention in Toronto. The car is a lot of fun to drive and is very reliable. No matter where we’re headed, the Giulia gets a lot of looks, waves, and thumbs-up!